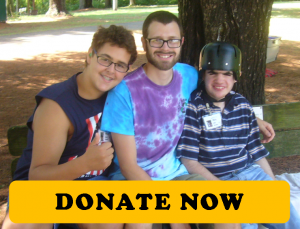 Camp New Hope’s Respite Weekends are mini-camp experiences that not only allows the campers time to build lifelong friendships, but also allows caregivers the respite time they need to recharge, knowing their loved one is being taken care of. Participating individuals aged 8 and up come to Camp New Hope instead of respite workers coming to your home. We hold our respite weekends twice a month from August to May. We offer a variety of fun activities ranging from Arts and Crafts, Music, Indoor recreation games, Movie/popcorn night and Special guests during the weekend. When the weather is warm, we also add in some swimming and playground time. In the winter, if it snows, we play in the snow and make snow angels! The campers come out on Friday evening and stay until Sunday morning. We stay in the respite building which can house up to 14 boys and 14 girls, along with our counselors, cook and Program Director. A nurse is available for medication administration. The Respite camper to staff ration is 2 staff: 7 campers.